Whether used in a commercial or residential application, Hakatai Classic series 3/4" tile is as versatile and durable as it is beautiful. And with its wide color palette of 44 colors (Whites, Blues, Greys, Reds, Greens, Oranges, Browns, Purples, etc) you’ll spend time designing, not compromising. Use the any of the glass tile in the line to brighten your bathroom or kitchen with glass tile that adds a clean line and look. With vivid color choices, from clean bright white glass tile, fiery reds and orange glass tile, calming shades of blue and green glass tile. 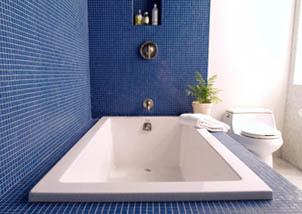 Your glass tile bathroom, kitchen backsplash, or pool project, will add color and creativity to your environment. Create the settting you desire with our mosaic glass tile. Tile size: approx. 3/4" x 3/4" | Sq. ft. per sheet: approx. 1.15. You can also use our online custom blend tool and custom gradient tool to create, price and order your own glass tile designs!